Hardy, Thomas (1840-1928) Jude the Obscure. [London: Osgood, McIlvaine, and Co., 1896.] 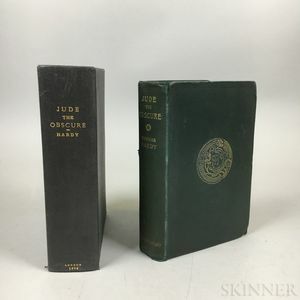 Octavo, Volume VIII of the Wessex Novels, bound in publisher's green ribbed cloth, gold stamping to front cover, lettered in gilt on spine, corners bumped and crumpled, housed in a blue cloth custom chemise and slipcase, 8 x 5 3/4 in.